Designing your fireplace requires that you take into account several important considerations: Fuel, Performance, Looks, and Cost. You need to weigh the results in these areas to find the perfect combination that works for you and your log cabin decor. For some people their only concern may be how the hearth looks; others may be swayed by the cost of the installation and also insist on a particular fuel. 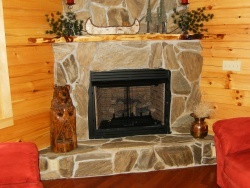 Being aware of these considerations can help you make the best choices when designing your cabin fireplace. There’s no denying the attraction that most people associate with a crackling wood fire, the warm glow of the flames against the walls and the smell of smoke. It’s primal and sensuous. But in some locales there may be ordinances against burning wood and obtaining the necessary firewood can be a chore even in the country. On the other hand, the newer wood-burning units are very efficient and can produce as much as 76,000 Btus, or enough to heat a 3000 square-foot home. Alternatives to a wood-burning hearth include a wood-burning stove or an electric or a propane or natural gas insert. 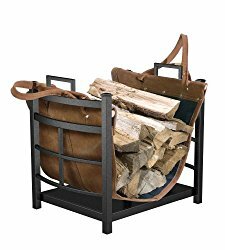 These are very convenient for producing a quick fire on demand without having to wait for a pile of wood to ignite. Folks with environmental concerns will also feel better about the lower combustion by-products produced using gas. It's clean-burning and doesn’t require loads of wood stored nearby for fuel. If what you’re after is primarily heat output, this can be achieved through either radiation, which we normally associate with a traditional hearth, or through circulating heat, where adding a fan can help distribute the heat around the room. The heat output, expressed in Btus, will be more useful to the occupants and not simply disappear up in smoke. This is another area where using alternative fuels can result in higher efficiency and greater ease of operation, at the expense of the traditional romance of a real wood fire. For many people the hearth is the focal point of their room and even their entire house. For ages, life has revolved around the heat and cooking place a fire provides and we want to maintain the importance of that role in the center of our homes. For others the appeal is simply utilitarian without the romantic pull. Units are now available with more than one side open for viewing so that two or even three rooms can enjoy a fire via a single chimney. The mantel and hearth can either stand out or blend into the overall design and décor of the room. Using an insert, you can frame up a hearthside inside your cabin and face it with stone, eliminating the concerns over weight and installation of a foundation. The old-style solid masonry chimney weighs (literally) a ton and requires a solid foundation and careful construction to distribute the weight. This takes a long time to build and costs a lot of money. Newer models utilize a double-walled flue in which the outer pipe draws in cool combustion air and surrounds the inner pipe which expels the exhaust gases and smoke. This keeps the dangerous hot gases on the inside and allows closer tolerances when constructing the chimney. It results in a safer and faster build process and saves money on both construction time and materials. These new, safer inserts allow you to face the chimney with whatever material you like: knotty pine wood to blend into your walls, dry-stacked stone to simulate a solid chimney, painted drywall on which to hang your art, or whatever you can dream up. A fireplace design is only limited by your own imagination and a perfect fireplace design can be the central focal point of your home, as well as the ideal place to curl up with a book and the dog on a cold winter’s day.